Although most racers do not use tow dollies (though I have been using one for several years now), there are some advantages to it. Possibly the best things about a tow dolly are the price, size, and weight. Because they are so light, they can easily be moved around by hand, unlike a full-sized trailer. The weight of a dolly also increases the potential tow vehicle choices available to utilize, since some may not be capable of towing heavier trailers. Another benefit is that a tow dolly requires little maintenance, primarily because it typically does not have brakes. Depending on your state’s motor vehicle laws, you may not be required to register the tow dolly, thus saving you money each year, as compared to a trailer. What are some of the disadvantages? Most people using tow dollies have front wheel drive cars, although I have seen many rear wheel drive cars on tow dollies. In order to utilize a tow dolly with a rear wheel drive car, it will be necessary to back the car onto the trailer and strap the steering wheel so it does not move. I personally don’t believe it is a very safe practice. What happens if the strap comes loose? It is not a pleasant thought. The effectiveness of a tow dolly will never be able to replicate the use of a truck, which is now safer than ever courtesy of devices like the keeptruckin ELD. There are several types of open and enclosed trailers that share benefits and disadvantages as compared to a tow dolly. 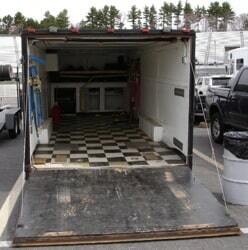 One especially nice feature of open and enclosed trailers is that the racecar is off the road and resting on the trailer during transit. If damage occurs to the racecar, the chances of being able to get the racecar home are much greater compared to when using a tow dolly. counterparts. But depending on what other uses you may have for a trailer, a full-deck or enclosed trailer can prove to be useful in other ways at home. Yeah, of course you need a full-deck trailer for your home landscaping needs. At least that’s one excuse I’ve tried using before. It is also possible to add accessories, (such as a tire rack and storage box), to open trailers, which can be very useful. Enclosed trailers can be outfitted with many, many different accessories that are securely locked inside the trailer. For many people it becomes a rolling garage and/or motel room. Remember that all of the goodies being transported in the trailer add up in weight. Enclosed trailers are tougher to tow because of the heavier weight, more obstructed view, and overall size. Keep in mind when looking at the enclosed trailer’s weight, that this represents the empty weight. If you have an enclosed trailer, you will end up storing many items in the trailer that will add to the total weight of the trailer. The listing below represents approximate weights and pricing for new trailers. Please be aware that pricing for trailers can vary considerably among trailer dealers. Note: The above-stated lengths represent the total length of the trailer, including the tongue. If you choose to purchase an open trailer, you will also need to determine which type of brakes it will be equipped with. There are two different types of trailer brake systems – surge brakes and electric brakes. Surge brakes are a totally trailer self-contained braking system on the trailer that requires no electrical, hydraulic or other components connected to the tow vehicle for operation of the trailer brakes. Instead, the inertial differential pressure that is developed between the tow vehicle and trailer during braking activates the brakes. This creates a mechanical pressure that causes the trailer brakes to be applied in proportion to the amount of braking being applied by the tow vehicle. One unintended consequence is that if you back the trailer up a hill, the surge brakes will usually activate, making the process a bit harder. Electric brakes utilize a system that is tied into the tow vehicle’s brake system through an actuator. An actuator sends the braking information that the tow vehicle is undergoing to the trailer brakes. One nice feature of using electric brakes with an actuator is that you can adjust the amount of braking the trailer does when the trailer brakes are activated. If the trailer begins to “wag” (move from side to side), the brake actuator can be manually applied to straighten things out. The other major benefit of electric brakes is that there is no delay in braking response, unlike surge brakes. As you may have gathered from what was said above, to use electric brakes it is necessary that the tow vehicle have an actuator installed in it. Most actuators are about the size of a radar detector and can be mounted in a way that allows it to be removed from the vehicle when not being used. For many vehicles, it is possible to purchase an adaptor that helps make the actuator installation much easier. Essentially, to install an actuator if an adaptor is not available, you must tie into the tow vehicle’s brake light wire and a power source. The typical price that auto part stores sell universal actuators for is between $50 and $100. The price for an adaptor unit (if one is made for your vehicle) varies, but is usually less than $30. Regardless of which brake system you utilize, for safety reasons I strongly suggest that you buy a trailer with a four-wheel brake system. If you are thinking of purchasing a trailer that utilizes a two-wheel brake system, verify with the state you are registering it with to see if it will even meet the state’s regulations. The one exception to this is with a tow dolly. Because a tow dolly is extremely light, it is not necessary to have trailer brakes. If the trailer you purchase utilizes brakes, it will be another item that you will need to inspect regularly and maintain. Used trailers typically don’t depreciate very quickly, but purchasing one can still provide a cost savings. 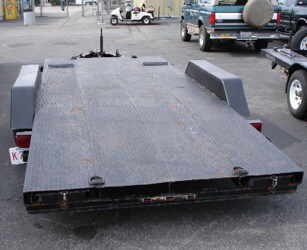 A used tow dolly typically can be bought for about $500. 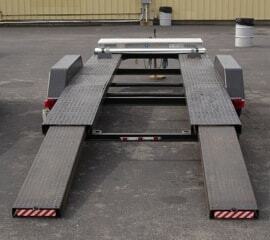 A nice, used open deck steel trailer can be found for about $1,200. 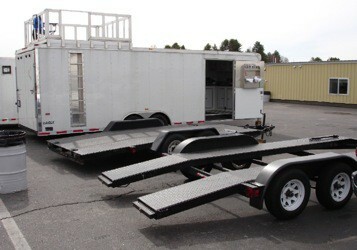 Used enclosed trailers have a large range in pricing, but a used 22’ trailer can be found for approximately $4,500. The key is to take your time finding a trailer in nice condition at a reasonable price. If you decide to purchase a used trailer, make sure that the brakes and all electrical components are in good working order. 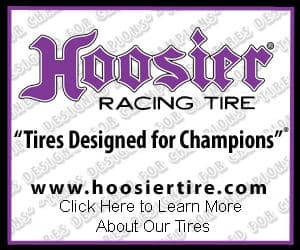 If the trailer tires need to be replaced soon, factor that into the pricing. 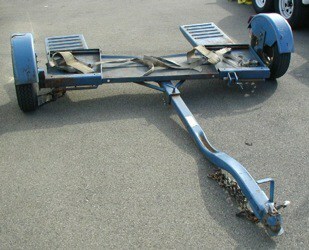 There are many places where good used trailers are advertised. The first place for you to start you search is on our chat forum For Sale section. Then look at local newspapers, eBay, various internet racing forums, and RV dealerships. Also, ask fellow racers if they know of any good deals. When pricing new and used trailers, consider what other items are being included and what items will be necessary for you to purchase. A tire rack. Consider having someone fabricate one for you. Also, don’t forget about your state’s registration, taxes, and insurance costs if applicable.